An international perspective is the consistent thread running through Tom Sandell’s career. The Swedish national studied international business and economics at Europe’s oldest university, Uppsala. Confiscatory tax rates in 1980s Sweden provoked a “brain drain” with many ambitious young Swedes heading for London or Frankfurt. Sandell instead moved to Paris and this relatively unusual choice foreshadowed a recurring pattern in his investment career – of searching for opportunities overlooked by others, with French equity markets recently providing some of Sandell’s most profitable trades. What inspired Sandell to become an equity analyst for Atlantic Finance in Paris was its reputation for being “the leading investment boutique, renowned for the best equity research in France, based on very, very in-depth analysis,” says Sandell. Soon after arriving in Paris, and at the remarkably young age of 25, Sandell was head-hunted for a head of equity research role at Delphi in Paris – but he was soon lured onto Wall Street by even bigger opportunities. In the late 1980s merger arbitrage was the most lucrative hedge fund strategy, producing eye-popping returns of 50% to 80% per year thanks to lots of topping bids and easy financing from the likes of Michael Milken. When the financial crisis and recession hit the US in 1990, Bear Stearns had the foresight to search outside North America for returns – and Sandell was the man they chose to diversify their multi-billion merger arbitrage proprietary trading business into Europe and beyond. At the time Bear Stearns was known to have “the tightest risk controls on the street,” says Sandell, since it was possible to generate great risk-adjusted returns even when fully hedging announced deals that had binding contracts. “Bear Stearns was all about capital preservation and taking the least risk possible,” he adds. Sandell identifies risk arbitrage supremo Ace Greenberg as an important mentor, and says that co-heads of the department, Bob Steinberg and Barry Cohen, were also key formative influences, who presided over “the best merger arbitrage team in the world”. Greenberg led a team of 15 that had worked on many iconic and ground-breaking M&A deals such as Kirk Kerkorian’s purchase of Chrysler, Harold C. Simmons’ innovative takeover of Lockheed Martin and several of Carl Icahn’s first audacious deals. The catalyst that shone the spotlight onto Europe was the single market for corporate control created in 1989. This “eliminated borders between countries and set in motion a common takeover code that broke down barriers based on protectionistic measures,” explains Sandell, who points out that governments could no longer veto deals. Bear Stearns was quick to exploit the potential, and by 1997 the risk arb desk was running more money outside than inside the US. The reason was simply that less well researched international deals were much more profitable than more well brokered US deals. When Sandell, by then co-head of the desk, flew the Bear nest to break out on his own in 1998, the firm was quite content to have accountants verify his performance and to allow him to market it. The timing of the Castlerigg launch was fortunate as Sandell had a stellar year in his first year, 1998, when many investment managers struggled due to multiple crises associated with Asia, Russia and Long Term Capital Management. Sandell says the firm blazed a trail as the first international merger arbitrage strategy in a market that was spoilt for choice in US merger arbitrage products. 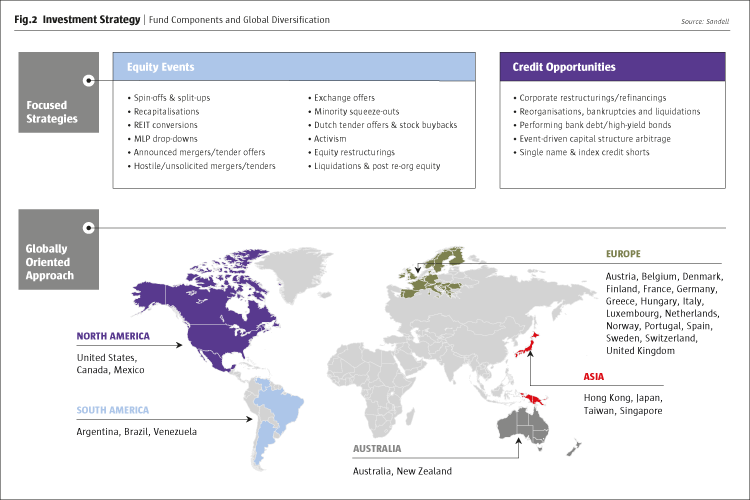 The strategy also appealed to investors as it was more geographically diversified (see Fig.2). Yet the portfolio was not more diversified in terms of positions. Sandell has always had the courage of his convictions to size maximum conviction positions as large as is in keeping with the risk framework. In practice this usually means 10% for all strategies, including the UCITS product. These concentrated portfolios have often proved more resilient than more diversified funds. “The first priority is always capital preservation,” he says, and often this imperative implies larger positions in maximum confidence trades. Sandell strategies have generated strong risk-adjusted returns, with very low beta to the equity markets since inception. For example, the Castlerigg Merger Arbitrage UCITS fund launched in October 2010 has already become a serial award winner. Although 2011 was a challenging year for many event-driven portfolios, Sandell’s UCITS fund eked out a small gain of 0.31%, helping it to win The Hedge Fund Journal’s inaugural UCITS Hedge performance award for the best performing merger arbitrage fund. In 2012 the climate for event investing was much more conducive, so double-digit returns were required to outpace the peer group. Once again, the Castlerigg Merger Arbitrage UCITS fund’s 10.95% return, for the institutional euro share class, secured it the UCITS Hedge performance award. Last year, the UCITS fund also won an award in Italy, where UCITS is a particularly popular fund structure: the 2013 MondoAlternative awards identified Sandell’s UCITS as the best fund in the alternative event-driven category. Perhaps surprisingly, 15 years after Sandell launched Castlerigg, the pattern of relative returns persists. Sandell continues to find his most profitable deals outside the US, where the merger arbitrage space is less crowded, less experienced and less understood. Most of the real money in merger arbitrage is made from topping bids. Agreed deals tend to offer much slimmer spreads and most of these friendly deals hold no interest for Sandell, although they are much easier to analyse. He actually understands why not everybody is comfortable with these deals, citing his invaluable experience in the 1980s and 1990s when the whole legal framework was being shaped. “You have to make your mistakes in each and every country, to find out what can go wrong in each country,” he explains. These lessons from deals in Norway, Portugal, France, Australia and New Zealand have informed his future position-taking. Sandell is particularly surprised that many of his competitors do not even seem willing to venture north of the border into Canada in search of better returns. Research has shown one example here, the hostile takeover of Hathor Exploration in 2011, where the first bid at (C$)3.75 by local miner Cameco was trumped by global player Rio Tinto at (C$)4.70. Also in 2011, in the technology space Mosaid received a bid from local IT firm WiLan at (C$)38 before Sterling Partners outbid at (C$)46. A third example from Canada and from 2011 was Zarlink where Microsemi started out with a bid at (C$)3.35 representing a 40% premium, before raising it to (C$)3.95 to the deal done. In all of these cases, the second bid was pitched at least 20% higher than the first bid – and these deals helped to produce profits for event-driven portfolios in 2011 when many US deals were breaking. “I have as much experience in France, Denmark, Norway or Portugal as in the US or Canada,” Sandell says – and stresses that any of these markets, or any others that he follows, can provide the highest conviction positions. As well as merger arbitrage, all of Sandell pursues a wide repertoire of other event-driven trading strategies both in equities and credit opportunities, including: re-capitalisations, REIT conversions, MLP drop-downs, exchange offers, minority squeeze-outs, dutch tenders, equity restructurings, liquidations, post re-organisation equity, activism, performing bank debt and high-yield bonds. MLP (Master Limited Partnership) drop-downs are one type of trade that can sometimes be very profitable. Southern Union is a good example of an announced plan to drop its gas assets into an MLP. An MLP often engendersmultiple expansion from EBITDA multiples of 10-11 up to 15 or 16. There were plenty of precedents for peers spinning pipelines out into an MLP, but Southern Union wanted to wrap its entire business – pipelines, processing, gathering and distribution of gas – into this tax-efficient structure. The scope for value enhancement from MLP suggested that a takeover offer by Energy Transfer at $33 was far too low, purely based on EBITDA comparables. A competitive bidding war ensued and very nearly reached this target, with Williams raising to $35, and Energy Transfer entering the fray at $39, before Williams trumped again at $44. The company was ultimately sold for $44.25 to Energy Transfer. Sandell is confident that the tax advantages of MLPs are sustainable. A current holding, Spectra Energy Corp, is an under-performing stock where Sandell sees significant upside of at least the 30-50% he seeks, if Spectra takes several value-enhancing steps. According to the White Paper shared with The Hedge Fund Journal, Sandell wants to see Spectra wrap its US Transmission assets into an MLP structure, and spin-off or divest both its wholly owned Canadian Westcoast Energy Inc operation, and its 50% stake in DCP Midstream LLC. This could, Sandell contends, eliminate conglomerate discounts and change the investor perception of Spectra from a utility to an energy infrastructure business – with a commensurately higher valuation. Sandell cites precedents of similar companies pursuing similar actions, such as his 2011 Southern Union trade. Real estate investment trust (REIT) conversions can have the same tax efficiency-driven rationale as MLP drop-downs. Thinking laterally, companies do not have to be mainly or exclusively involved in real estate to become a REIT. So long as a company owns some of its own properties there is scope for a REIT conversion, as the US Internal Revenue Service (IRS) wants to create a level playing field for companies seeking conversions. One example of a potential REIT conversion in Sandell portfolios is Iron Mountain, which owns property for data storage. Sandell opportunistically swooped on the stock when it dropped 25% in June of this year after an informal IRS investigation spooked some investors and dashed hopes of a REIT structure being created. Sandell, however, has taken regulatory, legal and tax advice leading to more positive conclusions. He expects the IRS investigation to go well and pave the way for a REIT conversion that could provide 30-50% upside from current levels. Iron Mountain’s share price currently ascribes zero probability to a REIT conversion happening, in Sandell’s opinion. “The lesson of 2008 was not to mix assets with different liquidity profiles,” says Sandell. Lessons have also been learned from the liquidity crunch of 2008. 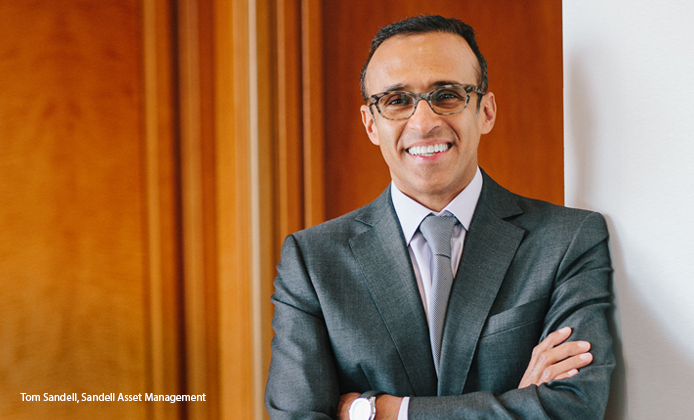 The firm has added a risk management and drawdown control procedure, which will reduce portfolio exposures automatically, with the first cut at a 10% loss of NAV, and further cuts at 15% loss of NAV. Sandell’s firm could not be run by one man alone, and the team at Sandell is very senior. There are 30 people, with five in London and 25 in New York, with average industry experience of 15-16 years. Senior investment professionals have worked together for between six and 12 years. Proprietary analytical tools include monitoring dashboards built by a dedicated programmer, which allow Sandell to keep track of more than 400 events globally. “Whenever any deal becomes a red light or a green light, all the information is already there,” Sandell says. Technology has also been customised for the mid and back offices. Sandell has had a constructive view on event investing for several years now, and all of the positive drivers remain in place. Corporates are still sitting on several trillion dollars of dormant cash. Private equity firms also have plenty of dry powder, to the tune of hundreds of billions. With top-line growth generally hard to find it is easier to grow by acquisition than to do so organically. And valuations remain compelling, particularly in Europe. Yet value is not the only motivation for some deals, as some emerging markets are hungry for natural resources. Chinese acquisitions of Canadian companies may be the most obvious example here, although recently the largest US pork producer, Smithfield Foods, also fell prey to a Chinese bidder. 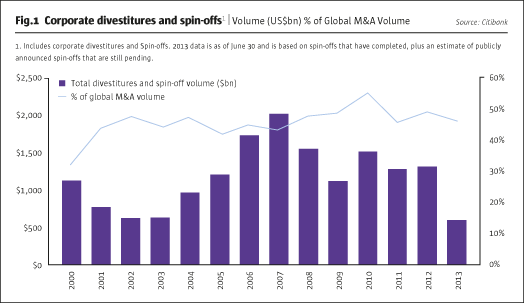 Spin-offs and divestitures represent nearly 50% of current M&A activity. The majority of Sandell’s portfolios have been in non-merger equity special situations over the past two years, where they are finding the best opportunities. Sandell did not at first expect a takeover for current portfolio position Smithfield Foods. The original investment thesis was the interest of activist shareholder Continental Grain taking a stake at $24.68 and filing a 13D arguing that Smithfield should divest some divisions, and return capital through dividends and buy-backs, to address the conglomerate discount. While Sandell sometimes takes the activist initiative himself, he is also content to follow the lead of other activists – particularly when, as in this case, Continental was able to nominate some of its own board members. In the event Smithfield’s value was recognised in a different way, through the all-cash bid from Henan Shuanghui at $34 a share. Another current portfolio position with an activist flavour is Compuware. Sandell first bought Compuware at $8.50 after it dropped 20% on a profits warning. The big picture of it missing earnings numbers obscured the value hidden in one dynamic unit: the Covisint data interaction platform, growing at 30% a year. The company had already mooted spinning off Covisint, which may have helped to entice Elliott Capital to make a hostile bid at $11. That triggered a competitive auction process where five or six parties are now conducting due diligence in the data room. Sandell expects several competing bids when the process is finished. These two stocks show how the environment remains healthy for event investing. When The Hedge Fund Journal spoke to Tom Sandell earlier this year, he thought that markets were moving into “the second innings” of the equity event cycle. Thus far this view has been vindicated, although some arbitrageurs have been shy after being bitten by deal breaks such as TNT. Reflecting on 15 years of managing his own firm, Sandell says he did not have any high hopes of raising the $850 million he now manages; he just wanted to be an entrepreneur, and started with just a few million dollars of his own money. There was no seed capital involved, and subsequent assets under management grew rapidly. In current market conditions, Sandell feels he could easily deploy several billion dollars without diluting position sizes. The firm could easily scale up to $3 billion without reducing exposure to the “mid-market” deal flow that Sandell sees as the “sweet spot” in terms of risk/reward ratio.